Bangalore. The two-day brainstorming sessions on issues related to Jammu Kashmir concluded with the resolve to change the discourse, by presenting and propagating the cultural legacy of Kashmir in the right perspective. A strategic gathering of academic & legal experts, senior RSS functionaries and political leadership discussed the road map to correct the discourse on Jammu Kashmir, which has been distorted by forces inimical to India’s interests. 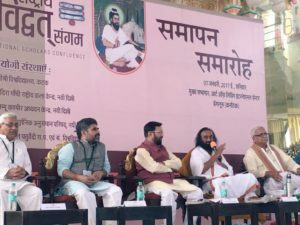 The National Confluence of Scholars was organized to mark the conclusion of millennium year celebrations of Kashmir’s great philosopher Acharya Abhinavagupta. Art of Living Foundation hosted the 40-session scholars meet. Sri Sri Ravishankar Ji has presided over the year-long celebrations of Acharya Abhinavagupta. Chief Guest Prakash Javadekar Ji, Union Minister for Human Resource Development, termed Acharya Abhinavagupta as the “greatest philosopher on earth”. Addressing the gathering of over 300 scholars, strategists and legal luminaries, he said Acharya Abhinavagupta was the embodiment of Indian thought, which has always questioned established norms and created positive change. “We have been the knowledge destination of the world, even thousands of years ago. Had there been a system of international ranking those days, Indian thinkers would have certainly bagged all the positions from 1st to 10th,” he said, to resounding applause. The Union Minister also promised every possible support for research and studies on Acharya Abhinavagupta’s works. Sarkaryavah of RSS Suresh Bhaiyyaji Joshi, said there’s been a dedicated effort to present a distorted image of Kashmir to the world. “When we say Jammu Kashmir is an integral part of India, it is not a political statement at all. It has been an intrinsic part of India in every way since thousands of years. We are celebrating thousand years of Acharya Abhinavagupta, who was instrumental in propagating the basic principles of Bharatiya thought through Shaiv philosophy – from Kashmir in the north to the southern most areas of Bharat,” he said. “Jammu Kashmir is the land of Shakti, of Ma Vaishno devi temple, Kheer Bhawani temple… It has been the land from where teachings on cultural values have emanated. 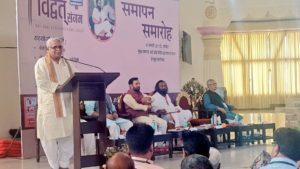 We have to work towards making Kashmir the same land of knowledge, peace and awakening that it was,” Bhaiyyaji told the august gathering. “The basic purpose of two-day National Scholar’s Confluence on Jammu Kashmir at Bangalore is to ensure that the issues discussed here become the discourse of the entire nation. The intellectuals, academia, media, decision and policy making institutes should have the issues discussed in these sessions as part of their discourse. We will make efforts to take the conclusions, arrived at by experts at the National Scholar’s Confluence, across the country. We firmly believe that whatever problems are present in Jammu & Kashmir the root cause of them are only two: Misinformation in Jammu & Kashmir and lack of information in rest of India. So, when there is a lack of information then perception is wrong and these wrong perception leads to wrong decisions. And when decisions are wrong then implementation cannot be right. Now, if we aim to change the basic perspective about Jammu & Kashmir within the state and across the country then we need to usher change at the basic information level itself. For this to happen, correct information needs to reach every corner of the country and based on this a correct discourse should develop about Jammu & Kashmir, and this is the necessity of today,” said Arun Kumar, RSS Pracharak and member of the All India Executive Council of the RSS. “Those who had ruled this country till now had first set up a discourse and based on this discourse they established certain academia and the arguments put forth by this academia are not based on any research, rather those arguments only worked to cement their discourse. Unfortunately, after country’s independence the discourse that should have been established based on facts and evidence could not be established. I feel that the country should free itself from all kinds of “isms” and should also free itself from the Left or Right Wing camps and set up a discourse based on facts, correct information and evidence. This discourse will be in national interest, integrates the society and will be in our country’s interest,” Arun Kumar Ji said. It was indeed a strategic group of experts who came together to discuss the issue of Jammu Kashmir at the sprawling campus of world renowned spiritual guru Sri Sri Ravishankar. The inaugural session was addressed by J&K Deputy Chief Minister Dr. Nirmal Singh Ji and RSS all-India Sah Prachar Pramukh J. Nandkumar Ji with the active participation of pan-India scholars. 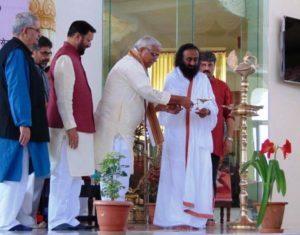 The National Scholars Confluence (Vidvat Sangam) was inaugurated on 6th January 2016 at the Art of Living International Centre, Bengaluru in the presence Sri Sri Ravishankar Ji. The National Scholars Confluence included eight simultaneous dialogue sessions on different aspects of Abhinavagupta’s works as also current issues – issues having far-reaching implications vis-à-vis Jammu Kashmir state. This mega-event is being attended by several Vice Chancellors, former defence personnel of Indian Armed Forces, professors, columnists, legal luminaries, senior advocates, former judges and other eminent members of the civil society. The two-day scholar’s meet involved parallel seminars on different disciplines on following themes. Each of these eight themes had five sub-themes discussed in separate sessions. So, a total of 40 sessions were organized in the two-day meet. The dialogue session on “Legal and Constitutional Status of Jammu Kashmir” involved legal luminaries who discussed the relevance and misuse of Article 370 and Article 35A in the light of recent Supreme Court decisions where the apex court had pulled up the High Court of Jammu & Kashmir for overreaching their ambit on Article 370. The Acharya Abhinavagupta Millennium Year Celebrations Committee headed by Sri Sri Ravi Shankar ji has been celebrating thousand years of Acharya Abhinavagupta since January 2016. Sri Sri Ravishankar was convinced of the relevance of Abhinavagupta’s teachings and consented to preside over the Celebrations Committee. “The yearlong Millennium celebrations of Acharya Abhinavagupta, the genius of Kashmir has evoked tremendous interest and enthusiastic response, not only among scholars and students but also among common people all across India. More than a dozen universities and institutions of art and culture have participated in these celebrations generating a great debate on relevance of his philosophy to modern India. It is therefore natural that the concluding event of the year-long celebrations should be celebrated as a multidimensional conference involving hundreds of university teachers and scholars in various fields to meet in Bangalore and exchange ideas and experiences about this great philosopher and also discuss various aspects of Jammu and Kashmir,” said Jawaharlal Kaul, Working Chairman of the Acharya Abhinavagupta Millennium Celebrations Committee and President of the Jammu Kashmir Study Centre.